Outside the Big 4 Box: Indie Patterns, PDFs, etc. I must confess I’ve had a bit too much fun with this bag. We’ve had great feedback from it so that helps. I had to try a smaller version/different fabric which is the size of the purchased pattern (11″ x 11″ x 3″) and then one more large bag in a third fabric. I like the smaller size for more of a “purse”. The blue fabric was thinner but still has good body and was easy to work with. The black and white webbing is fun-a bit wider but there isn’t much variety out there in a webbing that can accommodate the cording folded inside-which isn’t mandatory for the bag, just one way to do it. The gray fabric of the larger bag is nice but turned out to be too thick to get under the serger. It has more of a sponge feel on the inside so it needed to be lined on the bottom (whereas I didn’t do that on the others that had a nicer wrong side). The red faux leather fabric (see previous post) is sold out at the Southtown Hancock (I’d like to think that’s because of the Material Girls and their clientele ;)) but the black and white webbing, blue fabric, gray fabric and chevron lining is all available at Hancock. Can’t wait to reveal the March Bag of the Month! Tomorrow (Thursday, Feb. 20) we will be at Hancock Southtown for Serger Club at 10:30 (McCalls 6844 cardi) and a 1:30 Sewing and Serging Class (at which you, too, could make a bag or whatever you please). Sign up through the website or email us. 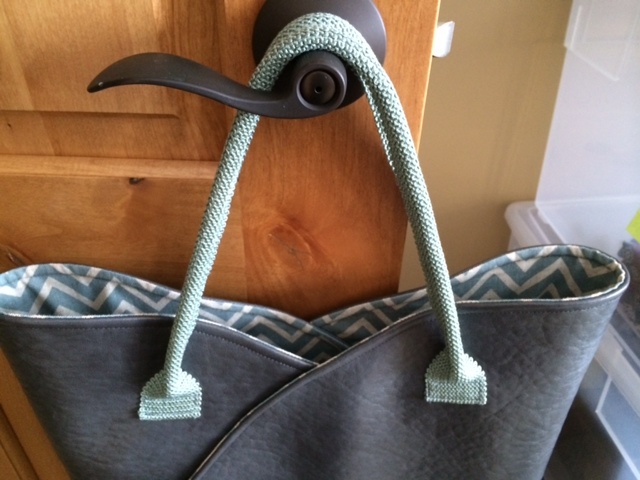 Posted on February 19, 2014 by KristinPosted in classes, Photos, Schedules, SergerTagged Bag of the Month, Purse-sonality, Serger Club. Previous Previous post: Happy Valentine’s Day! Great job on the purses, they all look so beautiful and reminds me of tulip petal which of-course we are all looking forward towards spring, after a long winter this year. I had made a real small version when adding a accessory to my Grandaughters new spring out fit. Keep up the great work and thank you for sharing. Thanks very much! The mark of a good pattern is that they all seem to turn out so good looking. I love your bags, they all look terrific!!! I’ve made a couple, and have gotten tons of compliments! You ladies are great!!! Material Girls is dedicated to teaching sewists in the Minneapolis/St. Paul metro area the techniques and skills to create the garments that they envision through Fashion Sewing Club, classes and private lessons. Enter your email address to follow us and receive notifications of new posts, classes and info by email. Did You Miss April Club? Fashion Sewing Club This Week! Fashion Sewing Club Starts This Saturday! Hanging out @joann_stores in Edina for the class open house. Sign up for Linen Shift class and learn how to put in invisible zippers! 50% off this weekend. Or make the ruffle blouse in the Ruffles and Bells class. Kristin on Did You Miss April Club? Angela Wolf on Did You Miss April Club? josephineann1 on Did You Miss April Club?